Just when we thought that the huge amount of publicity for anything remotely associated with Derek Jeter's 3,000th hit was starting to wear off, a new piece of memorabilia has emerged. MEARS Auctions has come into possession of one of the foul balls that was hit by Jeter during the historic, 3,000th hit at-bat and plans to include it in an auction that starts July 22nd. A total of four balls were used during the at-bat: three fouls and the memorable home run. The ball being auctioned is the second used in the at-bat. It was caught by a man in an arm sling who managed to fight off the masses to secure the ball. His son has issued a letter of authenticity as he saw the entire event and is also the consignor for the ball. As to where the other balls ended up, the first ball in the at-bat was hit into the backstop and retrieved by a ball boy. The third ball, the last of the fouls, is also in a fan's possession. It was caught by a ball boy who gave it to a young girl. It was the third ball used. 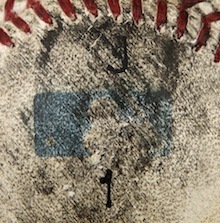 After Jeter got his 2,999th hit, Major League Baseball started marking balls to make sure there weren't any disputes over which was the real one the shortstop reached the historic milestone with. 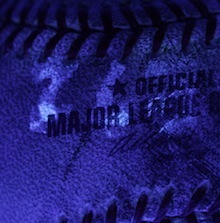 The Yankees turned over 48 balls rubbed with mud to be marked by the MLB with numbers, as well as a more covert marking that can be revealed with a black light. The foul ball in question is marked J1, which indicates it was the first ball produced in the group. A black light reveals another three-digit number. Images of both markings can be seen in the photos below. Visit the official release for more information. The auction will end on July 30th and will be listed on the MEARS Auctions website. Still on the topic of Jeter's 3,000th hit, Major League Baseball and HBO have joined together to produce a documentary covering Jeter's journey to 3,000. The special, titled "Derek Jeter 3K," will premiere on Sunday, July 28th on the cable network.